Bhalla: "This is the biggest one day rise we've seen"
NEW DELHI, India (CNN) -- Indian stocks Monday overshot their upper limit after the resounding victory of pro-reform prime minister Manmohan Singh's Congress party, forcing trading to close for the day. 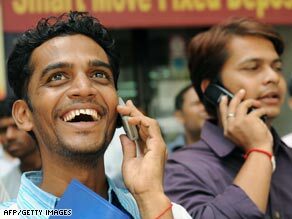 Onlookers outside the stock exchange in Mumbai Monday watch share prices surge following the election results. The benchmark Sensex at the Bombay Stock Exchange (BSE) surged 17.2 percent, or 2,099.21 points, after a two-hour halt. The gains forced markets to shut for the day. "This is the biggest one day rise we've seen," said Surjit Bhalla, chairman of Oxus Investments in New Delhi. "Even the most bullish (market watchers) didn't expect this. Pent-up investor demand resulted in the sudden investment surge. "The last five years, on the economic side, basically the government did zilch," Bhalla said. "Now there are no more excuses left, now (the government) has got a mandate." Singh, seen as architect of India's economic reforms in the 1990s, is set to reclaim power largely on the strength of his own party unlike in 2004 when he had to head a coalition dependent on support of communists. Monday was the first day when markets opened after the Congress party's definitive victory in Saturday's vote count from India's monthlong general elections.